The Transportation Security Administration (TSA) announced it will expand the number of workers that receive “secret” information on terrorist activity. Over the next two years, 10,000 TSA workers will receive clearance that allows them to access the latest reports on terrorist threats and tactics, in an effort to strengthen the agency’s counterterrorism capabilities. This is exactly the mindset the TSA should have. Instead of focusing so much on threats from years past, such as shoe bombs and liquids, the TSA’s attention should be on the here and now. Sharing current intelligence with front-line workers seems like a no-brainer, and the agency has been criticized for failures in this department. But greater focus on current intelligence would make the agency more effective, and go a long way toward quelling criticism of the TSA as nothing more than security theater. Execution is the key to success, and 10,000 workers is a lot of people to trust with sensitive information. Obviously the agency will be doing background checks, but there’s clearly a risk in disseminating this sort of information to such a large group of people. Hopefully the effort also reflects a renewed emphasis on communication within the entire agency. Too often it seems as if intelligence simply evaporates before it reaches its intended destination, or is flat-out ignored. But for all that could go wrong, this still seems like a good step, if only because it suggests a more sensible approach to airport security. Instead of treating every passenger as a potential criminal, the TSA should balance the fundamentals of airport security—namely looking for bombs—with a sharper focus on realistic threats based on current intelligence. Readers, do you think this is a positive move for the TSA? 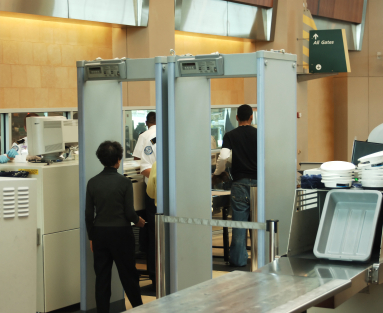 Does it scare you to think of so many TSA workers having such sensitive information? Carl: It doesn’t scare me per se that TSA screeners have secret security clearances except that it probably enhances the agency’s tendency to hide behind “faux’ credentials, which is already badly evident, counterproductive, and dangerous in the way that it tends to “enable” an agency without legitimate law enforcement authority or staffing. While I agree with you (and we said it in our film “Please Remove Your Shoes”) that intelligence is indeed the way towards fixing our current aviation security vacuum, it is a function that needs to be performed way upstream of TSA, for necessary interdiction of terrorists long before they get to the airport. Many in the field have simply argued that it’s just too late to stop them if they make it that far, And as Mohammed Atta and the close shave with the capture of the Times Sq. bomber have demonstrated, this observation seems to be a sound one. You criticized our editorialized suggestions for the security process at the end of the film as “platitudes.” While I could defend them, I’m not here to argue with an otherwise thoughtful movie review. But are Mr. Pistole’s recent moves even platitudes, or more like rearranging deck chairs on the Titanic? As you observed its likely effect, his motive is probably directed at PR and deflection of criticism, one of TSA’s driving but completely illegitimate goals as an agency. Someone or some group, potentially from congress, GAO or the White House, should camp out at the Office of Director of National Intelligence until they and Gen. Clapper have at least devised a solid plan to identify and route “tips” from embassies like the one before Pan Am 103 and NWA flight 253 last December. Because the real disgrace is not that the foreign outpost of TSA in Amsterdam failed to detect some explosives in someone’s underpants, but that a United States embassy on two key occassions is too unimaginative, lazy, or stupid to communicate some priority intelligence in a timely fashion to the world of aviation security in order to protect our passengers. The 911 commission issued its report on July 22, 2004, two and a half years too late to have any real influence on the structure and design of TSA, but instrumental in the creation of Office of Director of National Intelligence. If any organization needs to be “enabled,” it’s this one. TSA is largely superfluous. We should stop wasting money on it.